Rolling Stone asked its readers who they wanted most to see inducted into the Rock and Roll Hall of Fame. Coming in with the most heap o' votes? "Weird Al" Yankovic! Also making the list are Rush, The Moody Blues, Alice Cooper, The Beastie Boys and Jethro Tull. 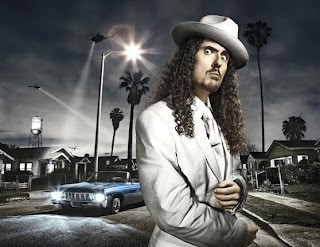 Personally, I think Weird Al and his entire band should get a Hall of Fame nomination. Those guys are among the creativiest and hardest-working musicians in the industry, for a way long time. Al deserves this... along with that much-needed star on the Hollywood Walk of Fame.